With the application economy in full swing, more organizations are turning to Continuous Testing and DevOps development practices in order to quickly roll out applications that reflect the ever-changing needs of tech-savvy, experience-driven consumers. Rigorous data they need, in the right formats. This forces teams to postpone their testing until the next sprint. As a result, organizations like yours are increasingly looking for ways to overcome the challenges of poor quality data and slow, manual data provisioning. They are also concerned about compliance and data privacy when using sensitive information for testing. 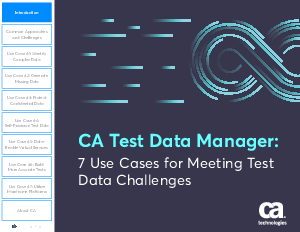 CA Test Data Manager can help you mitigate all these concerns, so you’re positioned to achieve real cost savings.